For the Tom Bradley International Terminal, see Los Angeles International Airport. 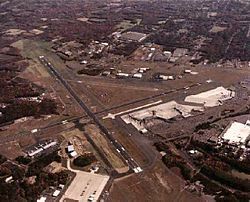 Bradley International Airport (IATA: BDL, ICAO: KBDL, FAA LID: BDL) is a civil/military airport in Windsor Locks, Connecticut, United States. Owned and operated by the Connecticut Airport Authority, it is the second-largest airport in New England. The airport is about halfway between Hartford and Springfield. It is Connecticut's busiest commercial airport and the second-busiest airport in New England after Boston's Logan International Airport, with about 6.4 million passengers in 2017. The four largest carriers at Bradley International Airport are Southwest, Delta, JetBlue, and American with market shares of 29%, 19%, 15%, and 14%, respectively. As a dual-use military facility with the U.S. Air Force, the airport is also home to the 103d Airlift Wing (103 AW) of the Connecticut Air National Guard. In 2017 Bradley was the 53rd-busiest airport in the United States by number of passengers enplaned. Bradley was originally branded as the "Gateway to New England" and is home to the New England Air Museum. In 2016, Bradley International launched its new brand, "Love The Journey". The Federal Aviation Administration (FAA) National Plan of Integrated Airport Systems for 2017–2021 categorized it as a medium-hub primary commercial service facility. The former discount department store chain Bradlees was named after the airport as many of the early planning meetings were held there. Bradley has its origins in the 1940 acquisition of 1,700 acres (690 ha) of land in Windsor Locks by the state of Connecticut. In 1941, this land was turned over to the U.S. Army, as the country began its preparations for the impending war. The airfield began civil use in 1947 as Bradley International Airport. Its first commercial flight was Eastern Air Lines Flight 624. International cargo operations at the airport also began that year. Bradley eventually replaced the older, smaller Hartford–Brainard Airport as Hartford's primary airport. 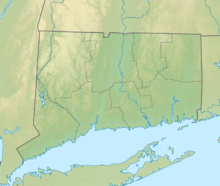 In 1948, the federal government deeded the Airport to the State of Connecticut for public and commercial use. In 1950 Bradley International Airport exceeded the 100,000-passenger mark, handling 108,348 passengers. In 1952 the Murphy Terminal opened. Later dubbed Terminal B, the terminal was the oldest passenger terminal in the US when it closed in 2010. The April 1957 OAG shows 39 weekday departures: 14 American, 14 Eastern, 9 United, and 2 Northeast. Nonstops never reached west of Chicago or south of Washington until Eastern and Northeast began service to Miami in 1967. 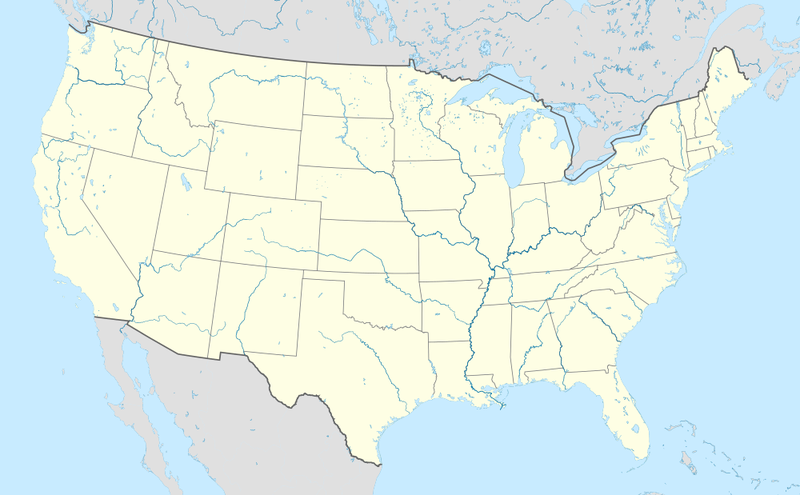 Nonstops to Los Angeles and Atlanta started in 1968. In 1960, Bradley handled 500,238 passengers. In 1971, the Murphy Terminal was expanded with an International Arrivals wing. This was followed by the installation of instrument landing systems on two runways in 1977. In 1976, an experimental monorail was completed to link the terminal to a parking lot seven tenths of a mile away. The "people mover" cost US$4 million and was anticipated to cost $250 thousand annually to operate. Due to the high anticipated operating cost, the monorail was never put in service and was dismantled in 1984 to make room for a new terminal building. The retired vehicles from the system are now on display at the Connecticut Trolley Museum in East Windsor, Connecticut. In 1979, the "Windsor Locks" tornado ripped through the eastern portions of the airport. The New England Air Museum sustained some of the worst damage. It reopened in 1981. 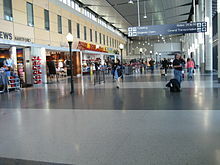 In 1986, new Terminal A and Bradley Sheraton Hotel were completed. The Roncari cargo terminal was also constructed. 2001 saw the commencement of the Terminal Improvement Project to expand Terminal A with a new concourse, construct a new International Arrivals Building and centralize passenger screening. The airport expansion was part of a larger project to enhance the reputation of the Hartford metropolitan area as a destination for business and vacation travel. The new East Concourse, designed by HNTB, opened in September 2002. In December 2002, a new International Arrivals Building opened west of Terminal B. This structure houses the Federal Inspection Station and has one jetway for deboarding aircraft. Two government agencies support the facility; U.S. Customs and Border Protection and the U.S. Department of Agriculture. The FIS Terminal can process more than 300 passengers per hour from aircraft as large as a Boeing 747. This facility cost approximately $7.7 million, which included the building and site work, funded through the Bradley Improvement Fund. Currently the International Arrivals Building is utilized by Delta Air Lines and Frontier Airlines (Apple Vacations) for their seasonal service to Cancun, Mexico and Punta Cana, Dominican Republic. All international arrivals except for those from airports with customs preclearance are processed through the IAB. International departures are handled from the existing terminal complex. On June 22, 2012, the Connecticut Airport Authority board approved the hiring of Kevin A. Dillon as the Executive Director for the Connecticut Airport Authority, including Bradley International Airport. On October 21, 2015, Bradley announced renewed transatlantic service, partnering with Aer Lingus to bring daily flights between Bradley and Dublin. Service to Dublin began on September 28, 2016. On September 13, 2018 Governor Dannel P. Malloy announced that Aer Lingus service at Bradley International Airport will continue for at least four more years under a new agreement made with the state, committing the airline to continue its transatlantic service at the airport through September 2022. Additionally, Aer Lingus committed to placing one of its first four A321neoLR aircraft on the Bradley to Dublin route. Norwegian Air Shuttle flew the airport's second transatlantic European flight. The first flight was on June 17, 2017 to Edinburgh in the UK. On January 15, 2018 the airline announced it would end service from Bradley to Scotland, with the last flight leaving March 25, 2018. The owners of TAP Portugal, a consortium headed by David Neeleman, have expressed interest in starting a direct route between Lisbon and Bradley International. On January 25, 2017, Spirit Airlines announced new daily nonstop service to Orlando and Fort Lauderdale along with 4 times weekly seasonal service to Myrtle Beach. The first flight to Orlando was on April 27, and service to Fort Lauderdale started on June 16. The same day, the company also announced seasonal nonstop service to Fort Myers and Tampa, which began on November 9, 2017. Bradley International Airport covers 2,432 acres (984 ha) at an elevation of 173 feet (53 m). It has three asphalt runways: 6/24 is 9,510 by 200 feet (2,899 × 61 m); 15/33 is 6,847 by 150 feet (2,087 × 46 m); 1/19 is 4,269 by 100 feet (1,301 × 30 m). In the year ending March 31, 2016 the airport had 93,678 aircraft operations, averaging 257 per day: 61% airline, 21% air taxi, 16% general aviation and 3% military. Sixty-four aircraft were then based at this airport: 48% jet, 31% military, 3% multi-engine, 11% helicopter and 6% single-engine. The airport has one terminal with two concourses: East Concourse (Gates 1-12) and West Concourse (Gates 20-30) The East Concourse (Gates 1-12) houses Aer Lingus, Air Canada, Delta, JetBlue and Southwest. While the West Concourse (Gates 20-30) houses American, Frontier, Spirit and United. The third floor of terminal A has the administrative offices of the Connecticut Airport Authority. Terminal B known as the Murphy Terminal opened in 1952 and was closed to passenger use in 2010. it was slowly demolished starting in late 2015 and ending in early 2016. It housed the Administrative offices of the CAA and TSA until its demolition. The Customs Building that is used for arriving International Flights has been dubbed Terminal B until a New Terminal B with 24 gates is rebuilt. All domestic destinations from Bradley International Airport (BDL). Military air transports that are commonly seen include aircraft such as the KC-135R Stratotanker from bases such as Pease Air Force Base in Portsmouth, New Hampshire and Bangor Air National Guard Base in Bangor, Maine. C-17 Globemaster III aircraft from McGuire Air Force Base and Charleston Air Force Base are a less common but occasional sight. Demolition of the existing Terminal B, realignment of surface roads and construction of the new garage/rental car facility would occur during the initial phase. The initial phase is estimated to cost between $630 million and $650 million. Actual completion dates could vary due to funding and demand, but as of May 2018 the project had not left the planning stage. Amtrak and Hartford Line trains serve both the nearby Windsor Locks and Windsor stations. As of 2018[update], weekday service includes eleven southbound trains and twelve northbound trains at Windsor Locks. In 2017, Bradley Airport was named 5th-best airport in the United States by Condé Nast Traveler's Reader's Choice Awards. Bradley scored well with readers in the categories of on-site parking, availability of charging stations and free Wi-Fi, decent restaurant options, and overall relaxed atmosphere. In 2018, Bradley Airport was named 3rd-best airport in the United States by Condé Nast Traveler's Reader's Choice Awards. Bradley scored well with readers in the categories of flight choices, on-site parking, availability of charging stations and free Wi-Fi, decent restaurant options, and overall relaxed atmosphere. On July 16, 1971 a Douglas C-47B N74844 of New England Propeller Service crashed on approach. The aircraft was on a ferry flight to Beverly Municipal Airport, Massachusetts when an engine lost power shortly after take-off due to water in the fuel. At the time of the accident, the aircraft was attempting to return to Bradley Airport. All 3 occupants survived. On June 4, 1984 a Learjet 23 operated by Air Continental crashed on approach to runway 33 due to asymmetric retraction of the spoilers, 2 crew and 1 passenger were killed. On November 12, 1995 American Airlines Flight 1572 crashed while trying to land at Bradley. The plane, a McDonnell Douglas MD-83, was substantially damaged when it impacted trees while on approach to runway 15 at Bradley International Airport. The airplane also impacted an instrument landing system antenna as it landed short of the runway on grassy, even terrain. The cause of the accident was determined to be the pilot's failure to reset the altimeter, however, severe weather may have played a factor. One of the 78 passengers and 5 crew on board was injured. On January 21, 1998 a Continental Express ATR-42, N15827, had an emergency during roll on landing. During the landing roll, a fire erupted in the right engine. The airplane was stopped on the runway, the engines were shut down and the occupants evacuated. The fire handles for both engines were pulled and both fire bottles on the right engine discharged. However, the fire in the right engine continued to burn. The airport fire services attended shortly afterward and extinguished the fire. ^ a b c "Calendar Year 2017 Passenger Numbers" (PDF). Bradley International Airport. February 2018. Retrieved February 25, 2018. ^ a b c d FAA Airport Master Record for BDL (Form 5010 PDF). Federal Aviation Administration. May 25, 2017. ^ a b c "Hartford, CT Bradley International Facts". Bureau of Transportation Statistics. Retrieved September 20, 2016. ^ "2008 Passenger Boarding Statistics" (PDF). Federal Aviation Administration. Retrieved February 11, 2010. ^ Stoller, Gary. "Bradley Airport's Makeover: Will You 'Love the Journey'?". Connecticut Magazine. Retrieved November 2, 2017. ^ Grant, Tina, ed. (1996). International Directory of Company Histories. 12. Detroit, MI: St. James Press. p. 48. ^ a b c d e f g h "Media Kit Fact Sheet". Bradley International Airport. Archived from the original on October 6, 2010. Retrieved October 9, 2010. ^ Marks, Paul (October 26, 2003). "Bradley: From Field To High-flying Hub". Hartford Courant. Retrieved January 26, 2013. ^ "People Mover, The Hartford Courant". ProQuest Historical Newspapers: Hartford Courant (1764–1987): A26. ^ "Our Collection". Connecticut Trolley Museum. Retrieved March 22, 2018. ^ "Windsor Locks: Bradley International Airport". Connecticut Explored. Retrieved March 22, 2018. ^ "Fact Sheet: Federal Inspection Station" (PDF). Bradley International Airport. Archived from the original (PDF) on October 6, 2010. Retrieved October 9, 2010. ^ "Rare A380 Flight from Dubai Diverted to Bradley". NBC Connecticut. February 27, 2013. Retrieved February 25, 2018. ^ Smith, Larry (June 21, 2012). "Airport Authority Board Formally Approves Hiring Executive Director". Windsor Locks-East Windsor Patch. Archived from the original on June 22, 2012. Retrieved July 3, 2012. ^ Kinney, Jim (October 21, 2015). "Aer Lingus announces nonstop flights from Hartford's Bradley Airport to Dublin". Mass Live. Retrieved July 8, 2016. ^ Seay, Gregory (April 25, 2016). "Why Bradley won its airport tug-of-war for Aer Lingus". Hartford Business. Retrieved July 8, 2016. ^ "Gov. Malloy Announces Aer Lingus Commits to Bradley International Airport for at Least Four More Years". State of Connecticut. September 13, 2018. Retrieved September 23, 2018. ^ "International airline ends service at Bradley International". AP News. January 16, 2018. Retrieved February 25, 2018. ^ "TAP Portugal Unveils JetBlue Codeshare, Free Stopover Program – Airways Magazine". Airways Magazine. June 13, 2016. Retrieved February 26, 2018. ^ Gosselin, Kenneth R. (January 25, 2017). "Spirit Airlines To Begin Flights From Bradley Airport". Hartford Courant. Retrieved February 25, 2018. ^ a b Kinney, Jim (June 16, 2017). "Spirit Airlines has first flight from Bradley to Fort Lauderdale; announces flights to Fort Myers, Tampa". masslive.com. Retrieved February 25, 2018. ^ Kinney, Jim (November 9, 2017). "Spirit Airlines flights from Bradley to Tampa & Fort Myers begin". masslive.com. Retrieved February 25, 2018. ^ "Spirit Airlines to Launch Nonstop Service from Bradley to Fort Myers and Tampa" (Press release). Connecticut Airport Authority. June 15, 2017. Retrieved February 25, 2018. ^ "Contact CAA". CT Airport Authority. Retrieved November 13, 2017. ^ "Aer Lingus taps $4.5M state subsidy after direct flights miss revenue target". hartfordbusiness.com. Retrieved June 27, 2018. ^ "Air Canada Map". ac.fltmaps.com. Retrieved February 2, 2019. ^ a b "AA Flight Schedules". American Airlines. Retrieved January 7, 2017. ^ a b "Departure Results List: Hartford/Springfield (BDL) (11 results) – Delta Air Lines Map". dl.fltmaps.com. Retrieved February 2, 2019. ^ "Bradley International Airport to launch new nonstop service to Raleigh Durham and Orlando". Bradleyairport.com. Retrieved January 29, 2019. ^ "Where We Jet". JetBlue Airways. Retrieved March 22, 2018. ^ "Southwest Airlines – Route Map". www.southwest.com. Retrieved February 2, 2019. ^ a b "Where we fly". united.com. United Airlines. Retrieved February 2, 2019. ^ "Via Airlines Coming To Pittsburgh International Airport". January 9, 2019. ^ "NER-CT-004 – 103rd Composite Squadron". CT Wing, Civil Air Patrol. Retrieved March 22, 2018. ^ I-91 Reconstruction from Hartford to Enfield; I-291 Construction from Windsor to Manchester: Environmental Impact Statement. 1981. ^ "Primary Airport Enplanement Activity Summary for CY2000" (PDF). FAA. October 19, 2001. Retrieved February 25, 2018. ^ "Summary of Enplanement Activity: CY 2001 Compared to CY 2000" (PDF). FAA. 2001. Retrieved February 25, 2018. ^ "CY 2002 Commercial Service Airports in the US with % Boardings Change from 2001" (PDF). FAA. November 6, 2003. Retrieved February 25, 2018. ^ "CY 2003 Commercial Service Airports" (PDF). FAA. 2003. Retrieved February 25, 2018. ^ "Primary Airport: Based on Calendar Year 2004 Passenger Enplanements" (PDF). FAA. November 8, 2005. Retrieved February 25, 2018. ^ "Calendar Year 2005: Primary and Non-Primary Commercial Service Airports" (PDF). FAA. October 31, 2006. Retrieved February 25, 2018. ^ "Calendar Year 2006 Passenger Activity: Commercial Service Airports in US" (PDF). FAA. October 18, 2007. Retrieved February 25, 2018. ^ "Final Calendar Year 2007 Enplanements and Percent Change from CY06" (PDF). FAA. September 26, 2008. Retrieved February 25, 2018. ^ "Commercial Service Airports (Primary and Non-primary): Calendar Year 2008" (PDF). FAA. December 17, 2009. Retrieved February 25, 2018. ^ "Commercial Service Airports (Primary and Nonprimary): CY09 Passenger Boardings" (PDF). FAA. November 23, 2010. Retrieved February 25, 2018. ^ "Enplanements at Primary Airports (Rank Order) CY10" (PDF). FAA. October 26, 2011. Retrieved February 25, 2018. ^ "Calendar Year 2011 Primary Airports" (PDF). FAA. September 27, 2012. Retrieved February 25, 2018. ^ "Commercial Service Airports, based on Calendar Year 2012 Enplanements" (PDF). FAA. October 30, 2013. Retrieved February 25, 2018. ^ "Commercial Service Airports based on Calendar Year 2013 Enplanements" (PDF). FAA. January 26, 2015. Retrieved February 25, 2018. ^ "Calendar Year 2014 Passenger Numbers" (PDF). Bradley International Airport. 2015. Retrieved February 25, 2018. ^ "Calendar Year 2015 Passenger Numbers" (PDF). Bradley International Airport. 2016. Retrieved February 25, 2018. ^ "Calendar Year 2016 Passenger Numbers" (PDF). Bradley International Airport. August 2017. Retrieved February 25, 2018. ^ a b "Calendar Year 2018 Passenger Numbers" (PDF). Bradley International Airport. February 2019. Retrieved February 9, 2019. ^ a b "Environmental Assessment and Environmental Impact Evaluation, New Terminal B Passenger Facility and Associated Improvements at Bradley International Airport Windsor Locks, Connecticut" (PDF). Connecticut Department of Transportation. Retrieved July 3, 2012. ^ "Northeast Corridor Boston/Springfield–Washington Timetable" (PDF). Amtrak. June 9, 2018. Retrieved June 19, 2018. ^ "Hartford Line Official Inaugural Schedule" (PDF). Hartford Line. June 16, 2018. Retrieved June 19, 2018. ^ "The 10 Best Airports in the U.S." Condé Nast Traveler. Retrieved November 1, 2017. ^ "The 10 Best Airports in the U.S." Condé Nast Traveler. Retrieved December 24, 2018. ^ Accident description for N101PP at the Aviation Safety Network. Retrieved on April 11, 2019. ^ "Collision with Trees on Final Approach American Airlines Flight 1572, McDonnell Douglas MD-83, N566AA Accident Report Detail". National Transportation Safety Board. November 13, 1996. Retrieved February 25, 2018.